You don’t even know how long I thought about using a clickbait title, certainly longer than 2 minutes. But, I don’t want to scare away my 3 loyal readers from last time. I was also thinking about advertisements, might aswell grab those 3 cents my readers would bring in? But uhh… I decided not to as I honestly was too lazy to click on some buttons in WordPress. For those out of the loop, this is a follow-up on my first post ‘It’s me Kevin, and I accept the IBM Master the Mainframe 2018 challenge!‘. I hope you don’t watch your Netflix shows from finish to start, right? 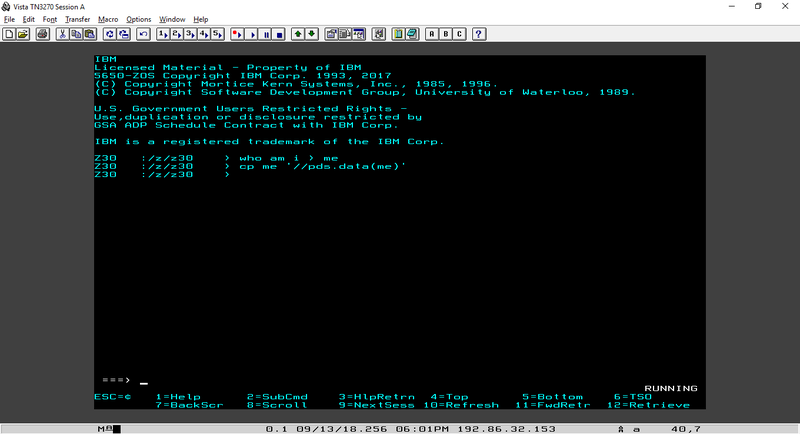 This time I’m completing part one of IBM’s mainframe course. The Amuse Buche’ is some JCL (Job Control Language) to allocate the required dataset for part one and two. The following line of code will do the job. Next up, submit the job. Don’t worry, I also don’t know what’s behind that line of code. And what is JCL? 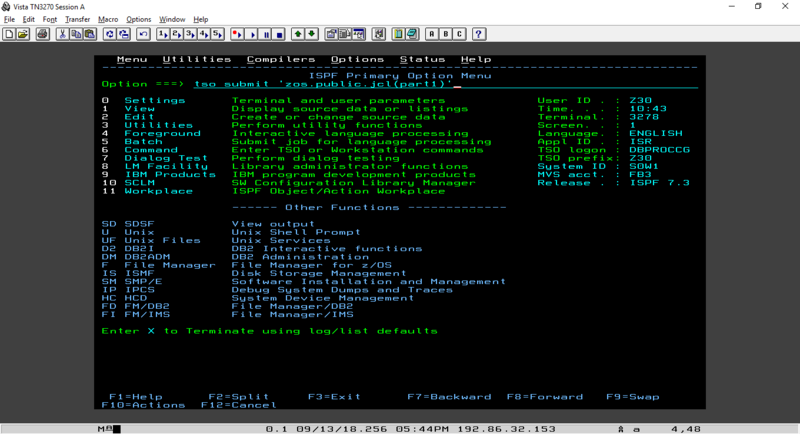 Well, JCL is a scripting language used on IBM-mainframes to send intructions to the Job Entry System (JES2/3) where it can start a program, start a filter job or instruct when to skip a step. Now all I need to do is verify that I successfully allocated the dataset. Inside the Data Set List utility I need to search for a dsname that matches my TSO userid. And voila! The main course for this evening is creating files and directories inside the z/OS UNIX environment. I’m going to echo my credentials to a file called ‘me’. Then copy that file to my PDS.DATA dataset. After that I’ll go and edit the dataset using the e command, then select the needed content member (ME) using s to look into its content. This was only a very short introduction and so far the course hasn’t really explained what zos.public.jcl does. Is it a premade class and function I’m calling that IBM provided for us beginners? What’s the dataset for? Besides that, I’m now much more familiar with the z/OS ISPF interface and feel like I can handle the next challenge. Let me describe you how familiar I feel with the z/OS ISPF interface. Remember the first time you were holding someone else’s baby when you were a kid yourself? Well I’m no longer experiencing that level of fear when interacting with the interface. This blogpost was somewhat different, I started with the dinner idea and tried to include some courses but my creativity quit when I got to soup. Feel free to send your suggestions to cuisine@kevindurant.be! PS: Yes I heard you, from now on you can click on the images. I’ve submitted the tso job using “tso submit ‘zos.public.jcl(part1)'”, used a to enter the job name characters and then proceeded. I verified the dataset using utilities 3.4, filtered Dsname by my TSO id and checked if there were results. Then did the same again but filtered Dsname by /z/<lowercase>TSO id. Then returned to the ISPF Option Menu using return command. After that I entered u to open the Unix Shell Prompt to then enter the command who am i > me which created a file called me. 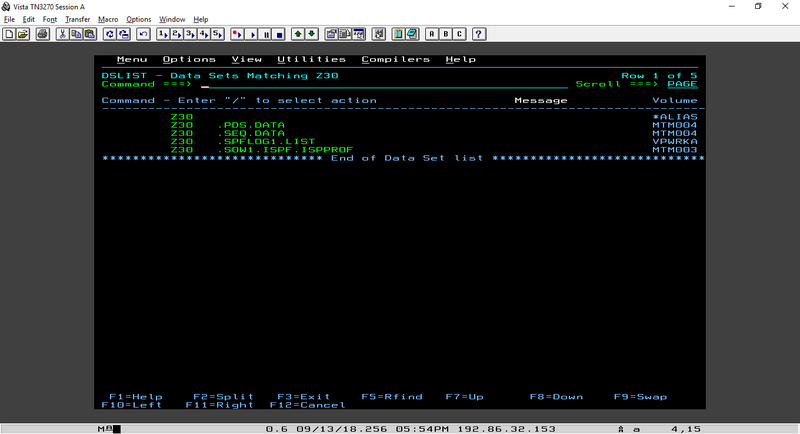 Then I copied the file using the cp command cp me ‘//pds.data(me)’. Exited back to the option menu using exit. Last but one I had to verify that me was inside PDS.DATA using the utilities. Narrow down to my TSO id and tab to Z######.PDS.DATA. Entered e to edit, then tabbed to ME and entered s to select and read. Latsly returned using return and ran tso scorep1 to check if I successfully completed the ‘challenge’. Previous Post It’s me Kevin, and I accept the IBM Master the Mainframe 2018 challenge!